You’re bound to feel a bit of hiker’s remorse — the sensation that choosing one fine trail means missing a better one down the road — no matter which trail head you choose along California Highway 35, also known as Skyline Boulevard. Picking a trail here is a bit like choosing a digital camera, except there won’t be one with twice the features at half the price by the time you finish reading this sentence. Limitations: Dogs allowed on leashes on designated trails (see maps, signs). Hours: Dawn till half-hour after sunset. Driving directions: Take Page Mill Road exit from Interstate 280, go west on Page Mill to Skyline Boulevard (California Highway 35) and head south for 3.3 miles; or take Highway 9 (from Highway 17 or 85) through Saratoga to Saratoga Gap, and head north on Skyline for 3.6 miles. So, where to start? Long Ridge Open Space Preserve is a nice choice for a host of reasons: easy to moderate trails, healthy mix of sun and shade, gorgeous views of the nearby Santa Cruz Mountains and, perhaps best of all, it’s right next to even more excellent hiking destinations, such as Upper Stevens Creek County Park, Castle Rock State Park and Skyline Ridge Open Space Preserve. 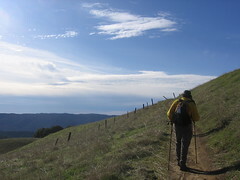 The map at the Long Ridge Trailhead lists eight properties managed by the Midpeninsula Open Space District; hard-core hikers have been known to visit them all in the same day. Exposed hillsides here are often dotted with wildflowers in spring, though this year’s show is a bit of a dud. Because it’s at the top of the ridge, walks are often through pines that don’t grow at lower elevations. This also means the return hike will be uphill, so save some strength for it. Standard precautions: Trails are well marked and maintained, but you still need a map; otherwise the names all run together. Watch for poison oak in the shade, and bring a windbreaker for the exposed ridges, since winds from the Pacific can go from comforting breeze to bone-chilling gale faster than you’d think possible. Stay alert for mountain bikers. Bring water; there’s none available at the trail head. Easy: The prettiest place at Long Ridge is a little pond along the Peters Creek Trail, a shaded, mostly downhill walk from the trail head on Skyline Boulevard. Another pretty single-track — off limits to bikes and dogs — is the Achistaca Trail, which connects to the storied Skyline-to-the-Sea Trail. Moderate: Hickory Oaks Trail in the southern section of the park has excellent overlooks. Ward Road Trail dips into Portola Redwoods State Park, leaving a healthy climb back to the trail head. Hard: Hike north into Skyline Ridge preserve to the nature center at Alpine Pond, one of the loveliest spots among the Skyline Boulevard parks. If you’re still feeling strong after that, hike another mile or so north to the overlook at Borel Hill in Russian Ridge Open Space Preserve.